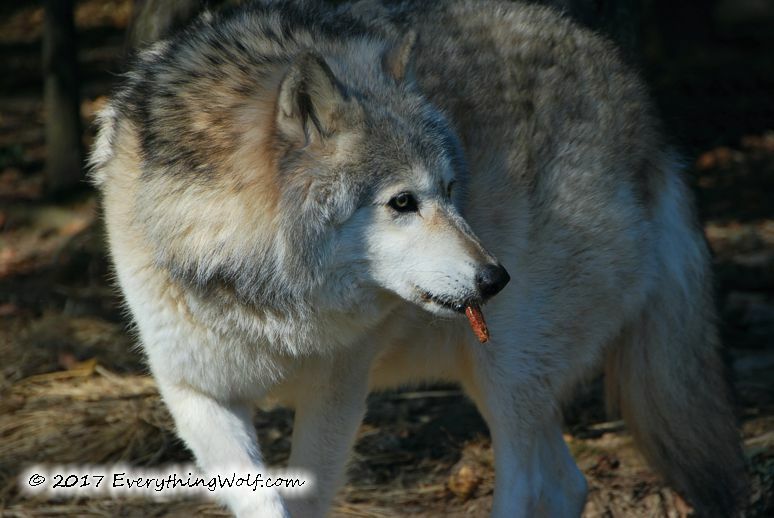 The Wolves are enjoying the cooler weather we are having in this part of the country. They are also starting to heal a bit from the loss of their Alpha Female, Chito this past August. They will never quite be the same but they aren’t quite so sad. Some highlights of the month were when we brought in their winter bedding, wheat straw. I don’t understand it, if it’s the tradition or just the fact they are getting something they can tear up; but they really do get excited about it. They actually were running around. Not quite as fast as they used to be when they were younger, but nonetheless, running. I also got them to finally howl again for the first time since Chito passed away. I was becoming concerned about the fact that I hadn’t heard their voices raised in song in months. They were actually quite hoarse when they started singing again, it had been so long. 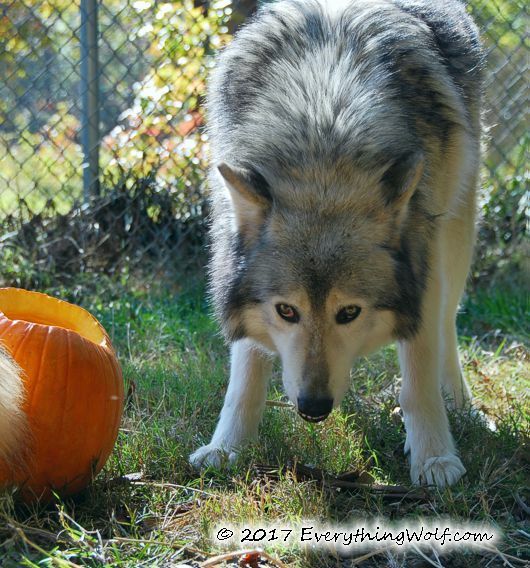 This brings me to introducing the first of two videos I’m sharing this month, Wolf Howls and Fun with Straw. 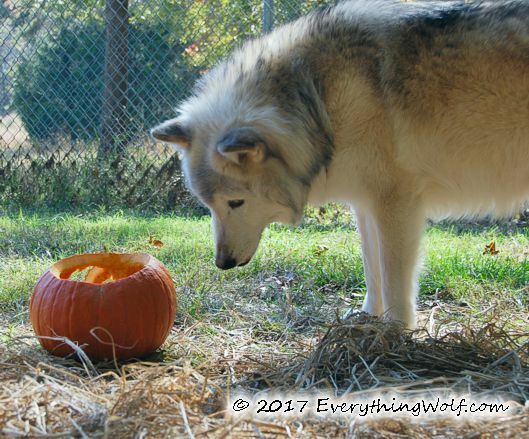 The second video is of their Halloween celebration. It’s a tradition at Wolf Howl that they have been participating in for the last 12 years. We carve and stuff pumpkins with treats. They had a good time and certainly enjoyed the goodies inside their jack-o-lanterns. You will notice in the Halloween video that Niko Akni has taken over as the leader of the pack. It’s very much a default setting for him but he’s coming around nicely with accepting the responsibility. He will never be a Chito; she was truly born to be in an Alpha position. Her parents groomed her for it. As you can see they have their winter coats back on. They are beautiful and thick. You can just bury your fingers in their lush fur. 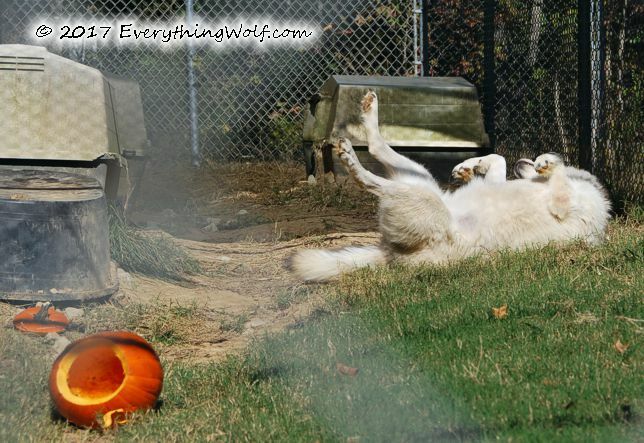 This makes it wonderful to be able to cuddle with a Wolf on a cold fall day.